So you are a hunter and you need a great hunting coat to keep you comfortable so you can focus on the hunt instead of the elements? Well, then we’ve got you covered. We have put together a list of our top 10 favorite hunting coats. You need a good coat to keep you well hidden and comfortable, which is why all of our top picks offer comfort, practicality and offer great features so you can focus on the big kill you have been waiting for. We want you to feel confident and excited for your new hunting coat purchase, so we hope our top picks help you find the perfect coat to ensure your hunting excursion is a success. A recent update has been done to highlight the comfort and benefits of our top 10 favorite hunting jackets on the market today. We have added three new awesome jackets: the Legendary Whitetails Camo Workwear Jacket, the Legendary Whitetails Lightweight Workwear Jacket and the ScentBlocker Matrix Men’s Jacket with Windbrake. Also, if you have any questions, please stop by our FAQ section at the bottom of the page. Happy hunting! When it comes to hunting in the cold weather, it's imperative that your gear is designed to handle the environment. One of your best pieces of protection is a high-quality hunting coat. To ensure that you purchase the best product, we performed an update on this buying guide to offer more comprehensive insight regarding our evaluation process. Additionally, readers will get a few tips and tricks along the way with answers to the most commonly asked questions. Choosing the right coat for your hunting needs can be overwhelming with all the options on the market today. And that’s why we have done the research for you and put together this list of our top picks. We have highlighted the benefits, pros, and cons, so you can easily see which one is going to be the best investment for you. Happy (coat) hunting. This coat has a fleece lining that provides comfort and warmth that fit in all environments. Also, it has unique features such as a high cut storm collar and elastic drawcord on the waist. Made from soft tricot, wildfowler hunting jacket is pretty silent when in motion, and enables the hunter to move without making a lot of noise. It has adjustable cuffs which facilitate fitting of the hunting gloves. The cost is relatively affordable. Also, the advanced features and quality match the price. 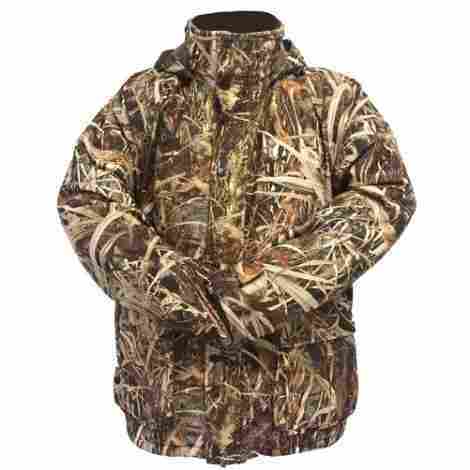 It is made of 100% cotton and polyester lining, which makes it highly insulated to keep the hunter warm all the time. For sure, this is the warmest jacket on the market. Even in very cold conditions, this jacket will never be of any doubt. It has heavy duty covers which makes it waterproof. 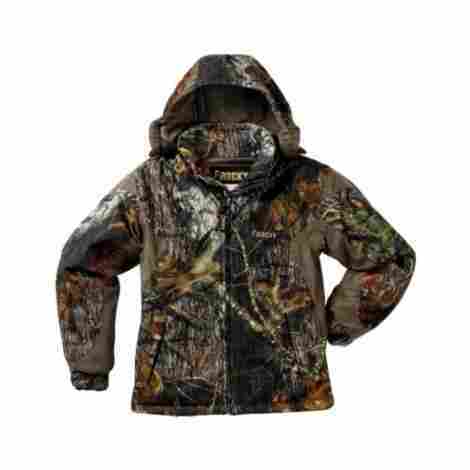 Therefore, by using this jacket, you will always remain dry and warm throughout your hunting expedition. Despite the advanced features of this jacket, the price is average. The competitive price is ideal for the hunters having financial constraints. It has double stitches which minimize the shedding. Although most ghillie suits feature single stitches, this one has double stitches to hold the thread on. The ghillie suits come in different sizes ranging from kid size, young adult, regular and extra-large. This costume is made of a 3D 7-color blend with different shades; green, black, brown and tan. The dry grass pattern is made up of the greenish-tan base which is a mixed olive thread and mimics grassland. What makes this coat so great is that it is extremely camouflaged. There is no need to look any further. This product has everything you could need and more! This feature keeps the hunter warm even during the freezing temperatures and therefore ideal for winter or cold weather. 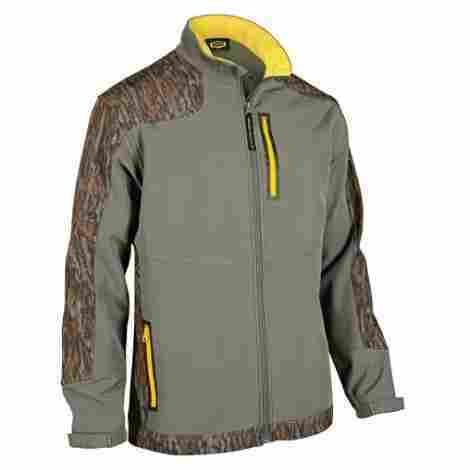 It is also made with poly fleece and 100% polyester for best hunter experience. 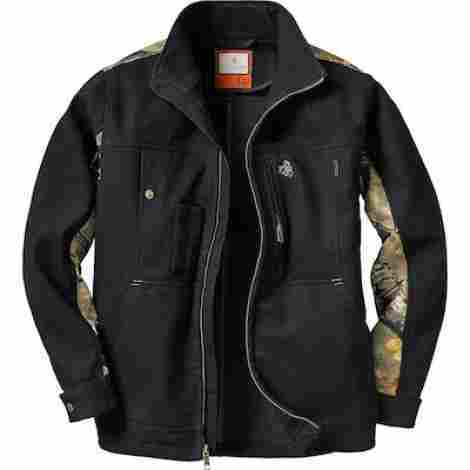 This jacket has nylon lining insulated with 6 oz which protects the hunter from cold and offers comfort. The fabric used to make it is quiet and breathable. It has a removable hood with elastic cuffs and a wristband. It is suitable for spring. 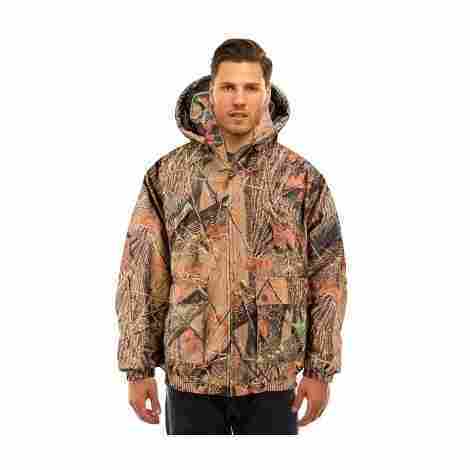 The price of this hunting jacket is relatively affordable. You can afford it, in spite of the advanced features and quality. This jacket is designed in a way that it allows air in and keep the water out. It comes with different size; this includes the kids’ jacket and the adult size. It features zip-off hood which is removable and an adjustable drawstring at the bottom. It features waist and adjustable waist which is easy to customize. This ensures that you get maximum protection from the cold condition and has good breathability. It also features elastic stretch sleeves which ensures water rolls down keeping you dry. The cost of Legendary Whitetail is relatively cheap compared to similar jackets. Always go for the hunting jacket which is pocket-friendly and has good features. This is a Legendary Coat offer a great look with functionality. It is a cotton canvas blend that is water-resistant. 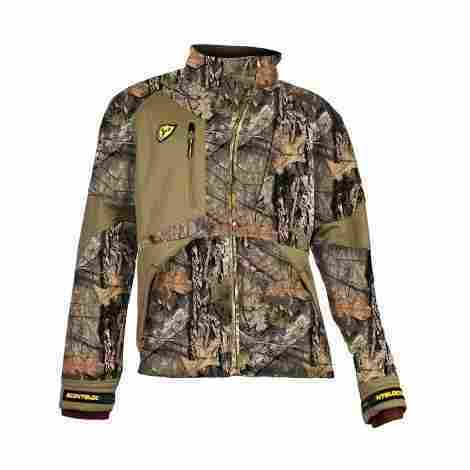 This jacket is also insulated with a polyester fleece lining which keeps you warm so you can focus on the hunt instead of the elements. 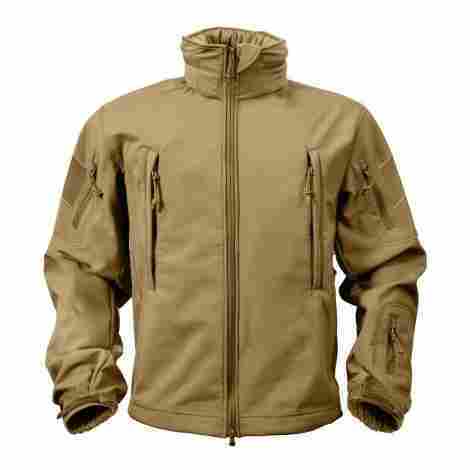 This jacket is designed with heavy duty durable material which gives it outstanding strength. It has been reinforced with stitches to have heavy duty zippers. Its long-lasting feature will save you an extra coin in the long run. It has extended cuffs with thumbholes to ensures the hunter has maximum protection from the cold environment. The hood in this jacket is fitted with adjustable drawcord which is elastic. This enables the hunter to use it conveniently. The cost is relatively fair. It is also worth it, given its advance providers which provide the hunter with maximum warmth and it is the best option for the winter. This coat is great for midseason. You might need some extra layers for extreme cold, but it keeps you warm while keeping odor at bay. Sounds like a winner to us! This jacket is developed with wind and water-resistant features that ensure the hunter remains dry throughout the hunting season. The prize of this jacket is worth its value considering that it is ideal for protecting you against the wind. It comes in different sizes for a wide range of people. 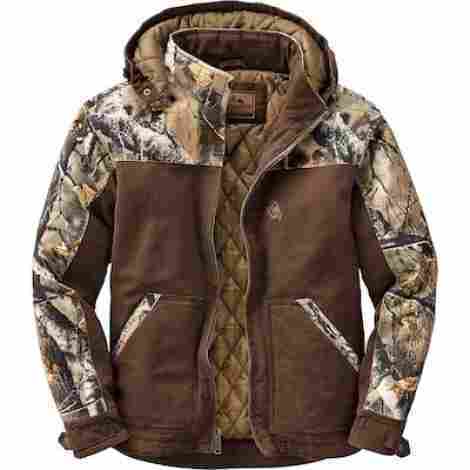 This is the best hunting coat from Rothco. It is made of 100% polyester material and has three layers inside. The layers are fitted inside to protect the hunter from extreme cold conditions. This will ensure they remain warm throughout their hunting experience. The layers in this material help in deflecting wind, keeping away moisture and retaining warmth. They are made from soft shell jacket and have waterproof polyester shells to keep the hunter fry during hunting. It consists of multiple colors. These comprise black, coyote brown, metal gray, midnight blue, olive crap and woodland camo. The hood has a detachable fleece lining. The price of Rothco jacket is relatively high compared to other jackets. However, its advanced features outweigh the costs. This jacket is usually ideal for the cold seasons. This coat has a unique design and style which makes it ideal for diverse environmental conditions. Yukon gear comes in different sizes ranging from country, snowdrift, mid-night to bottomland. This jacket is generally lightweight and is made out of Elastane blend and polyester. The polyester and Elastane components used to make this jacket makes it waterproof. It has the capability to zipper everywhere and guarantees safety of the hunter. From the distinct looks to the camouflage clothing, this jacket is made with advanced features for maximum protection. Compared to similar products, this hunting jacket is not expensive. It has great quality and low price ideal for your fixed budget. This is a heavy duty hunting coat which can be mistaken for a casual one. It has an outstanding design model that makes it stand out in the market. It is also for all weather conditions. This jacket is ideal for both cold and warm temperatures. Its thin feature enhances circulation of air, hence keep hunters warm during winter season. The Magcomsen coats contain specialized pockets in the sleeves to keep electronic devices. 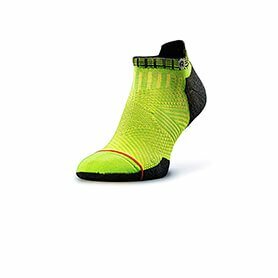 It has also cuffs which protect hands from harsh weather conditions. Despite its advanced features and great looks, this jacket isn’t costly. It comes at a pocket-friendly price. Material -this is the most important factor to consider when coming up with the best jacket for hunting. The material you chose should be determined by your hunting environment. If you are hunting in a cold weather or rigid areas, the mesh material is not recommended. However, a waterproof coat is required when it is raining. Design and color – as a rule of thumb, usually this product should camouflage with the environment. This will not only mask you from the animals present in the wilderness but also make your hunting experience exciting. A bright color is not recommended. Cost- Some coats are expensive while others are unworthy. Therefore, go for the pocket-friendly priced coat, as long as it’s the right quality for you. Advanced features- Consider the brands with advanced features. These features must be in line with your preference and taste for the best experience. When choosing the right coat for hunting, you must take into account some essential factors. These comprise the hunting environment, the design, cost, and color. Hunting coats will not only ensure that you get maximum protection from the adverse weather conditions and dangerous animals but also enhances your hunting expedition. Unlike other hunting gears and products that are resistant to change, hunting coats seems to change with the dynamic nature of the technology. It is therefore essential to get acquainted with the current market trends and coat brands. By doing so, you improve your ability to make better choices when selecting hunting coats that fit your specific tests and preferences. Now that we have covered the top ten best-hunting coats that users can get today, we are eager to share with our readers how we discovered the top ten and what we used to evaluate them. This is known as the criteria section of our articles and we use a set of criteria or guidelines to pick out the best hunting coats for you guys. As avid gear hunting lovers, nature lovers, and adventure lovers, we gathered our best team in finding the best hunting coats. In that process, we asked each other what the most important aspects of a hunting coat are and what do users require from their hunting coats. In this process, we learned that users particularly care about the material and the design, which we will cover in more detail. However, it is the durability of the coat that is the most important, considering that it is a hunting coat and a user will be wearing it out in nature, where vast terrains meet unique weather elements. With that in mind, let’s cover the area of quality and why the overall quality of a hunting coat is vital for the success of the coat. Let’s begin! The overall quality of a hunting coat is vital for the success of the hunting trip. Now, why is quality so important for individuals? Well, because in all honesty, without quality there is no reason to purchase the hunting coat. Readers and consumers want quality, value, and their money’s worth. We believe that the primary quality of a hunting coat is to act inconspicuous, to protect against weather environments, and to be warm enough to use in some of the worst weather. This is where the material design will come into play. Now, the following criteria are all used to determine the overall quality of the coat and we believe we chose the top ten best coats for individuals today. With that in mind, users can rest assured that the overall quality of the top ten hunting coats is excellent and that the coats will be able to withstand the test of time. With all that being said, let’s cover the coating material and why it is an important aspect when picking out the best hunting coats. A properly designed outdoor hunting coat is not hard to come by. However, how did we find the top ten? Well, the material design is a huge aspect of picking out a proper hunting coat. Whether an individual is crawling through a grass field, laying down in a bed of mud, or walking through pointy and prickly trees, the material used is vital for the overall quality of the coat. Taking this into consideration, users can expect these coats to be made from some of the best materials in the world. In fact, some of the coats are made from tactical-grade strength materials which ensure that they can be worn in even the toughest of terrains. Many of them are also designed to withstand a lot of beating throughout extended use. Some of the coat materials range from cotton shells to polyester interiors. Whether they are designed for comfort or for cold weather, all of the coats that we have included are designed with top of the line materials. 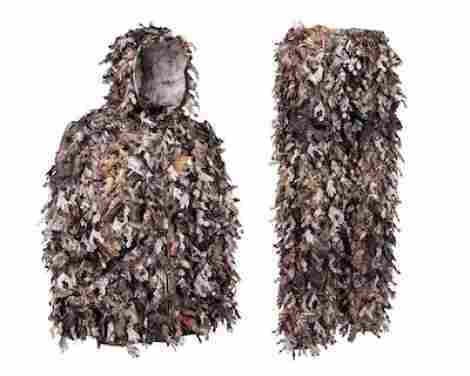 Take the double stitched gillie suit that is made from some of the most lightweight thread materials in the world. However, it is designed like a masterful hunting gear coat and suit. With that said, let’s talk about design and why design is so crucial to the quality of any hunting coat. When we took design into consideration we knew that this may be the most popular aspect of the best hunting coats. Depending on the type and style of hunting an individual may be accustomed to, the coat design will be different. 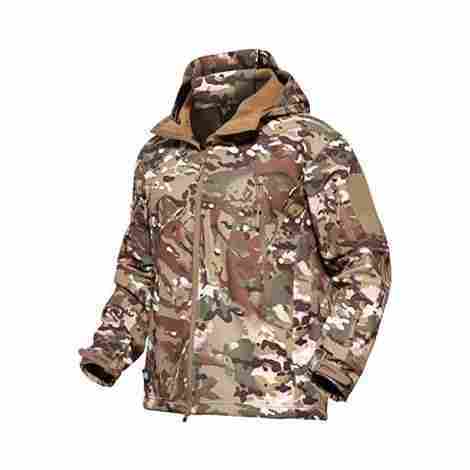 For example, there are many coats that are made from a camo style color, which we will cover in colors and style. However, as far as important design elements, many of the coats are designed to withstand intense heat by being UV protectant or to withstand intense cold temperatures. In fact, some of the coats have specially designed double stitching in seams to protect against water and other weather elements. The reason design is so important is that it adds to the durability and style of the coat. Depending on the design an individual knows exactly how much more gear to take and what the coat’s purpose actually is, other than keeping them covered and warm. Many coats have a-grade zipper pockets and are designed from some of the strongest materials available today. As we cover coat color choices and style we knew this would be one of the most important criteria for many individuals. Reason being is that not every individual wants the same coat color and style. Therefore, we wanted to include a wide variety. On this list, users will find everything from cotton shell camo coats to regular black cotton camo coats that users can use for everyday hunting. The style of the coat really determines the style of hunting that a person will do. Therefore, it is important for users to keep in mind what the coat is best suited for. As far as camo coats, they act more as inconspicuous coats so users are not spotted as quickly or are as evident as a regular hunting coat. Now, another important factor of hunting coats is the style, whether full camo, part camo, all color, or a ghillie-style coat. With that said, users can be guaranteed a wide variety of hunting coats and some brands even have different color choices to choose from. So if an individual likes a certain brand, they can check out the different colors available. With that in mind, how durable are all of the hunting coats we have talked about? As far as hunting durability, this is one of the most important aspects that an individual can take into consideration. Reason being is that durability is vital to the success of the coat and for an individual to feel safe while out in hazardous environments. However, not only the outside of the coat has to be durable, but also the inside and the overall quality of the coat has to be well designed and properly insulated. Now, what is durability to us? When we look at durability, we look at what users are saying about the coat as well as the overall craftsmanship of the coat. Are any of the materials cheap? Are the zippers properly made? Are the pockets double stitched? Is the coat made of tactical material? All of these factors together make up what we believe is coat durability. With that said, we can say that some of these coats are highly touted not only for their durability but their ability to withstand the test of time. Which brings us to one of the most important aspects to take into consideration, cost and value! How much is one of these coats? Without skipping a beat, we always talk about cost and value. The reason is that we always want to ensure that an individual is getting their money’s worth. Therefore, we take cost and value into consideration in every article. As far as cost, the overall cost of one of these coats will range drastically depending on a persons need. It is also important to keep in mind that the coat size and color will change the price a bit, even if it is from the same maker. Now, as far as value or goal is to ensure that individuals are getting exactly what they desire. With that said, many of these coats are designed masterfully to be able to withstand the test of time and designed with value in mind. With that said, let’s look at another important criterion we took into consideration, special elements that may make the coat stand out from all others. We only tend to include this criterion on sporting items and wearable gear. The reason being is that many different brands try to be the best when it comes to the sporting industry and then, in turn, design coats with different special features to take into consideration. Therefore, let’s talk about other design elements that are very important that helped us pick the top ten. For example, some of the coats included a water-tight seal double-stitched design that ensures that an individual can wear it in some of the most moisture-filled or during rainy weather. Other important design elements include inside pockets, detachable hoodies, and special inside liners to enhance warmth and comfort. With that said, special design elements helped us choose and decide the top ten best-hunting coats. Q: Is this coat machine washable? A: This is a question that many users were asking, and we can see why. In truth, many of the coats are machine washable. However, the ghillie suit is not because many of the fabric will fall off from the coat and shed. With that said, users should read the product description and instructions as some of the coats will require some special care to ensure it gets cleaned properly. In any case, many of the coats that are not camo-colored but are simple cotton black or brown coats are machine washable. Q: Is the coat designed for cold weather? A: This is another question that many users took into consideration when picking out the best coat. With this, users can rest assured that the coat is designed and made from the best quality materials. Now, what defines it as an ideal cold weather hunting coat? Well, the inside will be made from some of the strongest materials available, so users can feel warm as they go hunting. Mostly, the outer shell of the coat will have a protective exterior design or material to protect against harsh and cold environments. Best thing to do, as always, is read the product description. Q: Are their inside pockets? A: As another vital question that users took into consideration, inside pockets really depend on the design of the coat. With that said, users can expect that many of the coats will have an inside pocket design that is multi-use, so users can store any type of item they need while hunting. Q: Is the coat waterproof? A: As the last most frequently asked question, users wanted to know if the coat was waterproof. The really depends on the style and material of the coat. Now, there are some on the list that are and some that are not waterproof. However, waterproof and water-resistant are completely different. Water resistant means that it can wick away water like water drops, etc. However, waterproof means a person can jump in a lake with it. With that said, waterproof designs tend to be costlier and users can expect that the coat will be of better durability. Some waterproof design elements include double inseam stitching and a waterproof exterior coating to protect against heavy weather.